If you’re not flower-savvy, how do you know the appropriate flowers to send on different occasions? And what types of flowers have meanings that you may not know? With SO many flower types and arrangements out there, it’s a daunting task to choose the ideal bouquet. But we’re here to help. 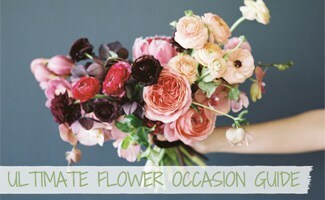 Check out our ultimate flower occasion guide to make sure your choice is thoughtful and appropriate. And if you’re looking for eco-friendly flower delivery services, be sure to read our reviews of the best online florists. Simply click on a link below to jump to the occasion you’re interested in or keep reading to learn all about flower gifting. The best flowers for a birthday gift should reflect the personality of the recipient and the type of relationship you have. A traditional vase of roses is always a safe option, with the appropriate color for your relationship (red for love, yellow for friendship, pink for a fun flirt, etc.). 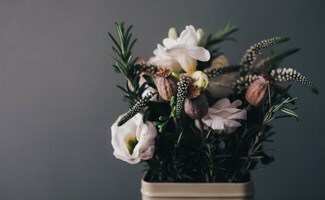 If the recipient likes uniqueness, go for an arrangement of exotic, non-traditional flowers. Looking for the best flowers for your girlfriend’s birthday? Try to find out her favorite flower or at least go with her favorite colors. This special touch will tell her that you remember what she’s shared with you. Or you can go with a fun, flirty arrangement with a mixture of bright, large flowers like hot pink roses, carnation, purple dianthus and Peruvian lilies. Take a look at this Pink Delight arrangement from From You Flowers. If you’re married, you should definitely know what types of flowers and colors your wife prefers! Many women love the romance of roses and the elegance that lilies bring to an arrangement. Add bright, romantic colors to the mix, and you’ve got a winner. Check out this gorgeous rose and lily bouquet you can find at From You Flowers. What are the best flowers for Mom’s birthday? Moms love the thoughtful gift of flowers for their birthdays. 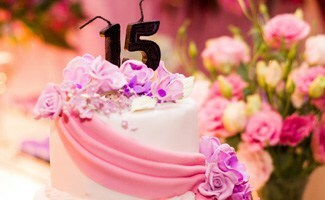 Some popular flower choices include lilies, tulips, daisies, carnations and roses. From You Flower‘s elegant and aromatic Bright Blue Skies Bouquet is sure to wow your Mom on her birthday. You might think roses are a must for an anniversary gift, but not necessarily. Sure, a dozen red roses are a tried and true way to share your love and are sure to please your wife. But if she’s a creative soul, why not mix things up? Some other romantic flower choices include lilies, tulips, orchids and irises. The Bouqs, an eco-friendly online delivery service, has some unique anniversary bouquets you won’t find anywhere else. Want to know what type of flowers for anniversary years are appropriate? Here’s a helpful guide to anniversary flowers by year list. Almost anything goes when choosing get well flowers — look for bright, cheery colors and plenty of greenery to convey a sense of growth and healing. Depending on the illness, you may want to opt for low fragrance flowers. Gerber daisies are a popular pick since they express cheerfulness and new beginnings and aren’t overly fragrant. Other popular choices are peonies, hydrangeas and potted plants. 1-800-Flowers has a great selection of get well bouquets, plants, balloons, gift baskets and more. What are the best flowers for hospital patients? Similar to get well arrangements, low fragrance bouquets might be in order. But for hospital patients, look for large blooms, vibrant colors and long-lasting flowers that will improve your loved one’s mood and liven up the sterile hospital room during his or her entire stay. Take a look at these get well bouquets rom From You Flowers for more inspiration. White calla lilies: represent resurrection. Orchids: stand for everlasting love, with pink and white as the traditional colors of sympathy. Carnations: red carnations convey admiration; pink stand for remembrance; and white symbolize pure love and innocence. 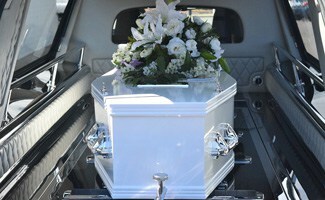 Chrysanthemums: very popular in funeral and sympathy arrangements. In some European countries, such as France, Italy, and Spain, mums are symbolic of death and are only used for funerals or on graves. Roses: Including a single rose in a bouquet symbolizes ever-lasting love for the departed. White roses convey reverence, humility and innocence. Red roses evoke respect, love, and courage. Pink roses denote love, grace and appreciation. Dark crimson roses convey sorrow and grief. Online florist Teleflora has a wide variety of high-quality and tasteful funeral bouquets, wreaths and sprays, and they deliver seven days a week, even on holidays. Are You Choosing the Right Color Roses? Every lady in your life loves roses, but with so many color variations, how do you know you’re making the ideal choice? Check out ProFlowers brief video to learn what each rose color means. Want Some Other Gifting Ideas? We have some unique gifting solutions to suggest if you’re looking for “out of the box” gifting ideas for birthdays, holidays or just about any fun occasion. Is your friend or loved one a health nut? Why not gift her a healthy snack monthly subscription. Check out our reviews of the best organic and healthy snack box subscriptions to learn more. Or is the lady in your life a wine lover? Consider giving her the gift of unique wines shipped to her home every month. See our wine club reviews on our sister site, Exploring Life’s Mysteries, for our recommendations. What’s your favorite flower delivery site and why? Favorite flower to give? Sally is a huge fan of fresh, organic food. One of her favorite hobbies is cooking with as many fresh herbs, spices and veggies as possible. And she's devoted to her all-natural skin products and cosmetics. It's saved her and her daughter from the curse of skin allergies. When she's not writing and researching (and being a Mom), you can find Sally getting down to earth in her home garden. I’m having trouble getting my coupon code to take on From You Flowers – there is a code pre-filled when I use your link. Hi Sally, we have an updated list of promotions here. It was informative when you said orchids are the ones that convey everlasting love and that they are also used for the traditional way of expressing sympathy. If that is the case, then I will get orchids to send to my friend whose father passed away last night. Of course, I would not want to send just any flower as I know they have different meanings. 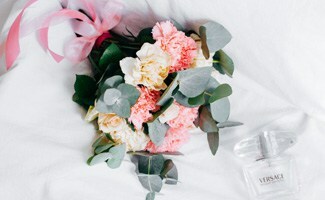 Hopefully, I can get a bouquet of pink and white ASAP since I live pretty far from the city. I’ve been wanting to find a an anniversary bouquet for my wife, and I think that getting some tips would be nice. I like that you talked about how for your 10th anniversary you should get yellow daffodils. I’m going to have to look for a few good anniversary bouquet and see what our options are! Thanks for the tip about considering if a flower service covers same day delivery. It would be good to consider this because it would ensure that you will get the flowers fresh. My mom’s birthday is coming up soon, so I’ll have to find a florist with same day delivery to help out. My mother-in-law recently underwent a surgery, so I’m looking at getting her some get well flowers. It’s good to know that I ought to look for a colorful arrangement that doesn’t emit a strong odor. I’ll definitely incorporate this into my search for a nice bouquet to send her. I had no idea there was so much meaning in the types of the flowers we give. Flowers are the perfect decoration when you’re renting office space. Flowers and wine are always equally welcome gifts. Oh the anniversary flower guide is good to know, and glad to see they get better flowers with time. Can’t get roses right away right?